Back to school can mean hectic mornings and fussy kids, but one thing that doesn’t have to be complicated is breakfast. 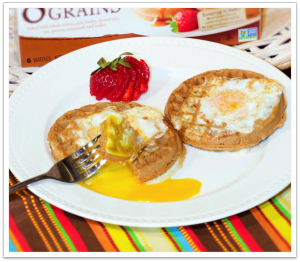 One of my go-tos for a quick and yummy morning meal is whole grain waffles—they’re a warm and toasty alternative to cereal or breakfast bars, and kids love eating them. Toast the waffle according to package directions. Top the waffle with 2 to 3 tablespoons of Greek yogurt (so the fruit sticks on). 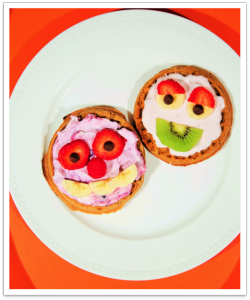 Then use your favorite fruits to decorate the waffle and create a smiley face. Anything goes—have fun with it! 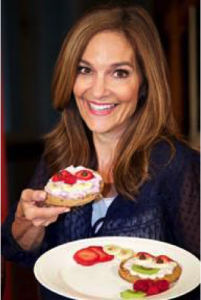 For example, create eyes using two slices of banana and a chocolate chip in the center; a raspberry works perfectly for the nose, and sliced kiwi fruit for the mouth. Toast waffle according to package directions and then cut a hole in the center. Spray a skillet with nonstick cooking spray, then heat over medium-low heat. Add the waffle to the skillet. Crack an egg straight into the center of the hole. Cook until the egg sets a bit on the bottom, about 1 minute. Using a spatula, gently flip it over. Let it cook until the yolk feels soft, or about 1 minute. Spray skillet with nonstick cooking spray and heat on medium-high heat. Add the apples to the warm pan and sprinkle with a dash of ground cinnamon. Sauté the apples for 2to 3 minutes per side. While the apples are cooking, toast the waffles according to package directions. Then cut each of them into 4 pieces. 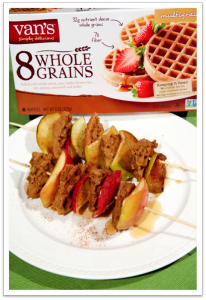 Using 2 skewers, alternate waffle pieces with 1 to 2 apple slices. Drizzle 1 teaspoon of maple syrup on each skewer before serving. This a sponsored post written by me on the behalf of Van’s Foods. All opinions are entirely my own.